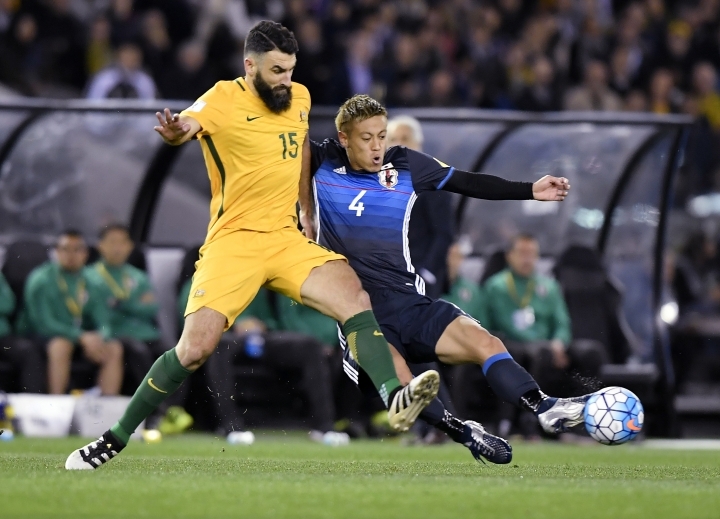 SYDNEY — Socceroos skipper Mile Jedinak has been recalled to Australia's squad for a pair of crucial World Cup qualifiers against Japan and Thailand. The Aston Villla midfielder missed Australia's Confederations Cup campaign because of a groin injury and has been sidelined since June but has been given time to prove his fitness for the last two qualifiers, away against Group B-leading Japan on Aug. 31 in Saitama and at home against last-place Thailand in Melbourne on Sept. 5. Japan leads the group with 17 points, one clear of Saudi Arabia and unbeaten Australia and seven clear of fourth-place United Arab Emirates. The top two teams in Groups A and B will automatically qualify for the World Cup in Russia, and the two third-place teams will meet to determine which goes into an intercontinental playoff. Tim Cahill and 21 other players involved in the Confederations Cup squad have been retained for the qualifiers. "We haven't strayed too far from the players who went to the Confederations Cup and who we have had on the radar for a while, so not a great deal of change at this stage," Australia coach Ange Postecoglou. "It is going to be a great challenge playing away from home against one of the top nations but that's what we like to embrace as a team. "We are looking forward to going over (to Japan) and hopefully getting three points which will put us in great shape for qualification." Squad: Mustafa Amini, Aziz Behich, Tim Cahill, Milos Degenek, Adam Federici, Alex Gersbach, Ajdin Hrustic, Jackson Irvine, Mile Jedinak, James Jeggo, Tomi Juric, Matthew Jurman, Robbie Kruse, Mitchell Langerak, Mathew Leckie, Massimo Luongo, Awer Mabil, Jamie Maclaren, Ryan McGowan, Riley McGree, Mark Milligan, Aaron Mooy, Tom Rogic, Mathew Ryan, Trent Sainsbury, Brad Smith, Matthew Spiranovic, James Troisi, Daniel Vukovic, Bailey Wright.